Today, you don’t necessarily use the words ʻEwa and Kalo in the same sentence – we tend to think of the ʻEwa district as dry and hot, not as a wetland taro production region. Some early written descriptions of the place also note the dry ʻEwa Plains. However, not only was ʻEwa productive, its taro was memorable. Ua ʻai i ke kāī-koi o ‘Ewa. He has eaten the kāī-koi taro of ‘Ewa. 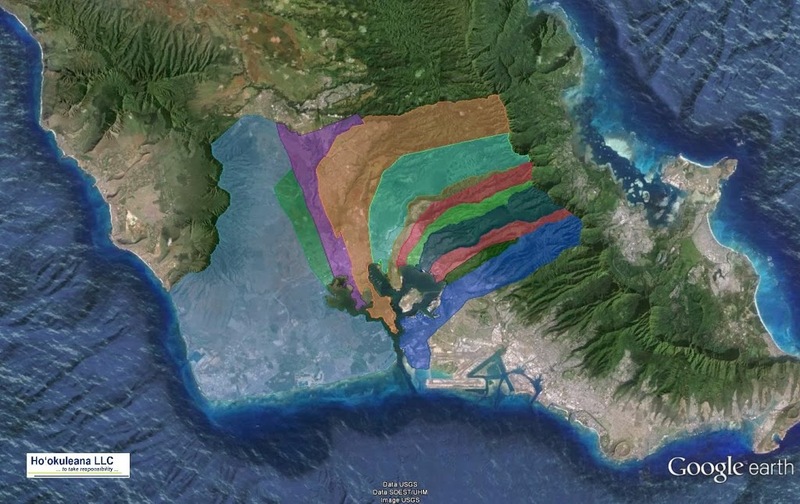 ‘Ewa was divided into 12-ahupua‘a, consisting of (from east to west): Hālawa, ‘Aiea, Kalauao, Waimalu, Waiau, Waimano, Mānana, Waiʻawa, Waipi‘o, Waikele, Hōʻaeʻae and Honouliuli. An 1899 newspaper account says of the kāī koi, “That is the taro that visitors gnaw on and find it so good that they want to live until they die in ‘Ewa. The poi of kai koi is so delicious”. (Ka Loea Kalai ʻĀina 1899, Cultural Surveys) So famous was the kāī variety that ‘Ewa was sometimes affectionately called Kāī o ‘Ewa. The image shows the ahupuaʻa within the Moku of ʻEwa over Google Earth. In addition, I have included other related images in a folder of like name in the Photos section on my Facebook and Google+ pages.